Like all baleen whales, the humpback finds its dinner among the small shrimp-like creatures known as krill. The baleen don’t hunt so much as graze through enormous schools of krill, moving through the krill open-mouthed and then trapping the krill in the ridges on the roofs of their mouths. “Famous for their dramatic leaps and vocal symphonies, humpbacks have provided excitement to thousands of whale watchers, especially around Hawaii,” said Peter Parnall. 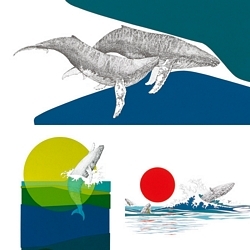 The 2016 fine art edition series of Parnall’s humpback whales offer a range of formats and emotions from "Humpback Whale’s" joyous vertical leap, to the deceptively simple playful splashes of "Recess," and finally the intimacy of "The Singers," a pair of humpbacks who have found a safe corner of their own under the sea.